These MIL-5015 style backshells provide strain relief from cable tension, environmental sealing, and 360° shield termination hardware. They offer the best in connector protection, with complete EMI/RFI and environmental protection for all mission-critical designs. MS3404 Type Jam Nut Recept. MS3401 Type Cable Mount Recept. 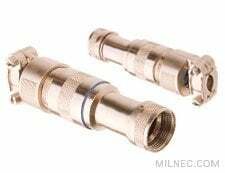 Milnec Interconnect Systems is a leader in the design, manufacture, and supply of high-performance cylindrical interconnect systems for military, aerospace, and industrial applications.